The founder is J. Christopher Pryor of Topeka. 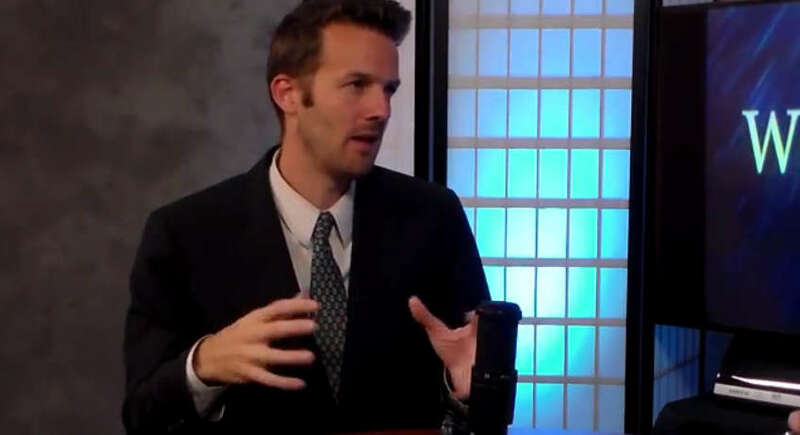 He has been published with the Journal for the Study of Antisemitism, David Horowitz’s NewsReal Blog, The Remnant, and Catholic Family News among others. He has a J.D., M.B.A. and B.A. in Philosophy. Pryor writes predominantly on issues of antisemitism, philosophy, current events and his hobbies of science and ham radio. To view the blog, click on coldfriday.org. 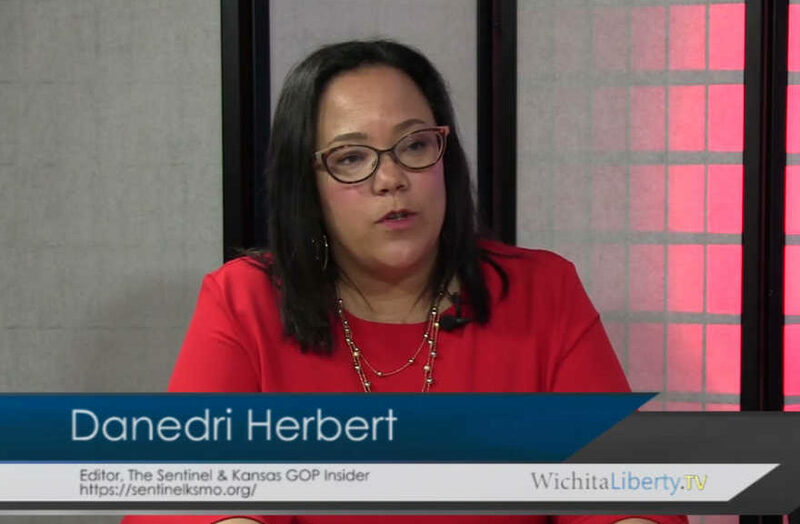 In this episode of WichitaLiberty.TV: The Sentinel’s Danedri Herbert joins Bob Weeks to discuss the upcoming gubernatorial debate, the Kansas Legislature’s website and transparency, and accountability in government. View below, or click here to view at YouTube. Episode 184, broadcast February 17, 2018. The Wichita Eagle’s coverage of the number of workers in Downtown Wichita isn’t fake news, just wrong news. A second set of Census Bureau data known as LODES will change with the departure of USD 259 from zip code 67202. 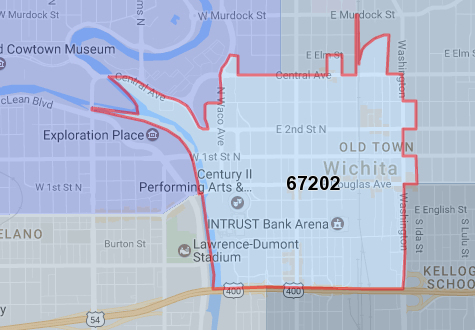 LODES is the source of 26,000 downtown Wichita workers claimed by Wichita State University’s Center for Economic Development and Business Research, the Wichita Downtown Development Corporation, the Greater Wichita Partnership, the City of Wichita, and other agencies. An earlier Eagle article from May 10 just scratched the surface on this topic. 4 That article described the Census Bureau data as erroneous. But there is no error in the data, as the Census Bureau plainly explains what the data means. 5 The error was in the application of the data by someone who used it to represent something it does not represent. Readers of the Wichita Eagle may be thoroughly confused by now. Can we expect a correction or explanation? The Eagle says no. 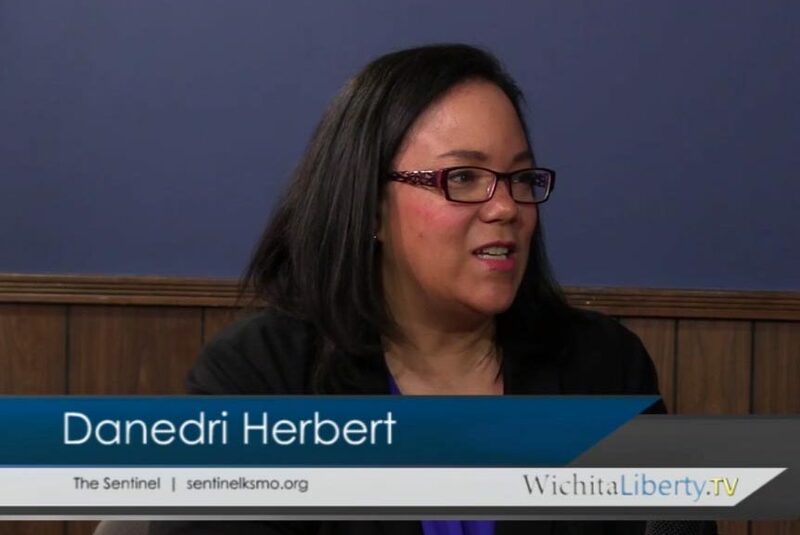 In this episode of WichitaLiberty.TV: Danedri Herbert of The Sentinel joins Bob Weeks and Karl Peterjohn to discuss news reporting and politics in Kansas. View below, or click here to view at YouTube. Episode 148, broadcast April 23, 2017. Should the Wichita Eagle, a city’s only daily newspaper and the state’s largest, be concerned about the parties to its business relationships? 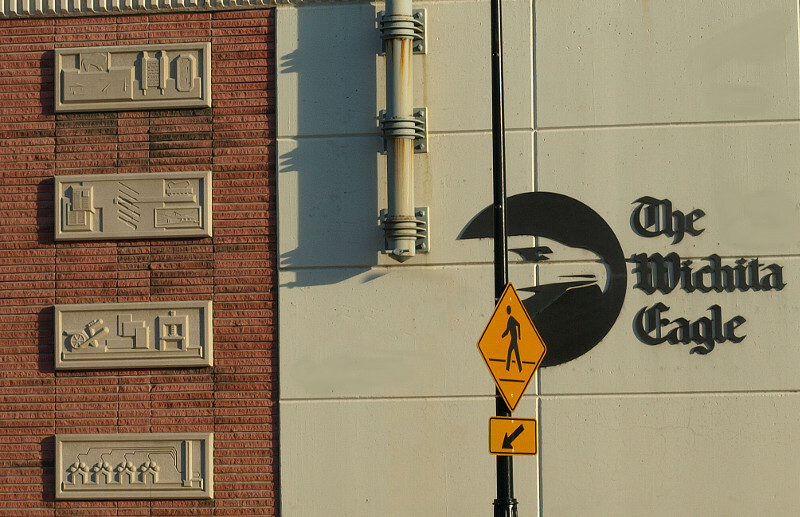 It’s a question that the Wichita Eagle should be considering. But the newspaper’s top executives seem to have no concern. On February 14 I sent a message to the publisher and executive editor of the Wichita Eagle expressing my concerns about the newspaper’s future landlords. That letter appears below. After several follow-up attempts by email and telephone, neither would respond. Sent I sent this message, I’ve found I was mistaken about the ownership of the building to where the Eagle will move and become a tenant. Brandon Steven is not an owner. I had relied on Eagle reporting1 from January, naming Steven as an owner. The reporter confirmed to me that was an error. An error in the digital archives of the Wichita Eagle which could easily be corrected. Of note, the Eagle portrays itself as a digital entity. One of the things about material published digitally is it can be easily corrected. As of today, the erroneous story from January 3 has not been corrected, even though the reporter knows she made an error. Is it important that a newspaper avoid business relationships or entanglements with parties that are frequently in the news? I’ve been told that the Eagle has to rent from someone, and Wichita is a small town. Well, not really. The Eagle owns its current building, which eliminated the relationship with a landlord. And if the newspaper wants to be a rental tenant, it could rent from the many landlords who are not frequent newsmakers, especially those that the Eagle needs to hold accountable. This is a sad episode for the Eagle. 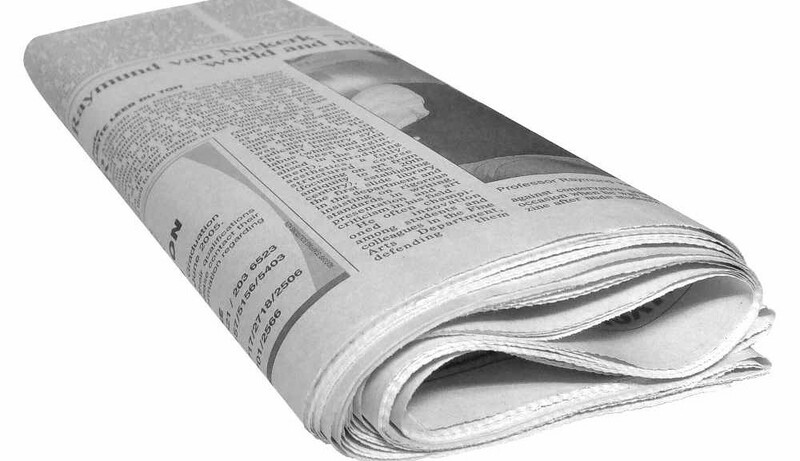 When Eagle reporters ask someone about uncomfortable topics and the subject does not respond to messages, the newspaper reports that, and in a negative light. Here, the top two executives at the Eagle would not comment on something they may be uncomfortable discussing. I think we deserve a newspaper with greater capacity for self-examination, and one whose executives are responsive to legitimate concerns. Following, the message I sent. Note the corrections indicated in footnotes. I’m writing because I’m concerned about some issues regarding the Wichita Eagle and its news coverage. The three parties are Brandon Steven, Dave Wells, and David Burk. While the Eagle is certainly free to do business with anyone it wants to, these three men are newsmakers that the Eagle has covered in the past, and will likely need to cover in the future. Mr. Heatherly, you may remember that last year at a Wichita Pachyderm Club meeting I asked you about the arrest of Brandon Steven (although I did not use his name), and why the Eagle did not cover this news. Other newspapers did, including the Topeka Capital-Journal and The Morning Sun in Pittsburg.3 4 Those newspapers thought the item newsworthy as Steven had recently been an applicant for a Kansas casino license, and factors such as a person’s reputation are relevant to these applications. Many thought it curious that the Eagle did not report this news. Regarding David Burk, he is a continual newsmaker in Wichita, and not always in a positive way. 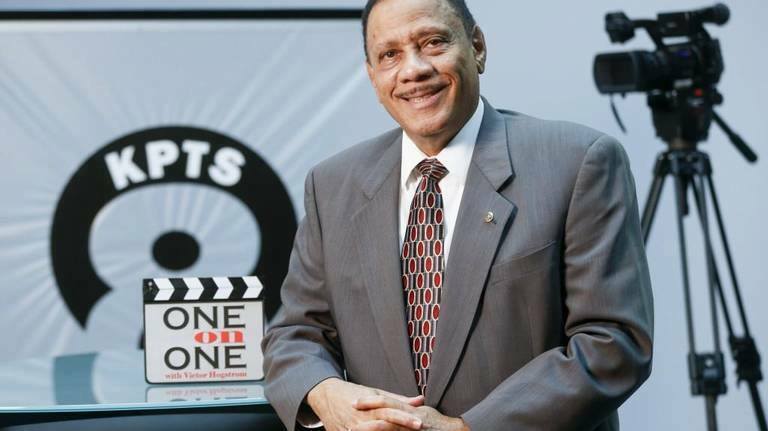 A notable incident was his appeal of property taxes on property located within a tax increment financing district, which defeats the purpose of TIF.5 6 Worse, he misrepresented himself as an agent of the city in order to obtain this benefit. When the Eagle reported on this, it rated designation of “special report.” Other than this, Burk is a newsmaker in that he has, for many years, made large and regular campaign contributions to many city council members, and has received much subsidy from the city through many different programs. When it was announced that the Eagle was selling its building to these parties, I was not comfortable with this transaction. But it was a one-time deal. Later we learned that the Eagle is to become a tenant of the same parties,9 a business relationship that is likely to last for a long time. When the Eagle gives these parties free publicity in future news stories, will readers need to be concerned about the motivation for the Eagle printing the stories? But more important: When these parties do something wrong, will the Eagle vigorously pursue an investigation? An investigation against its landlord? I hope you can understand my concern. I would appreciate receiving comments on this matter for a story I am writing for the Voice for Liberty. 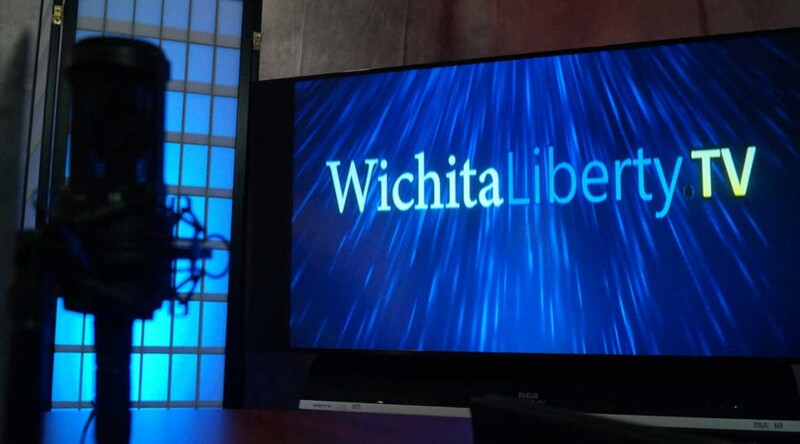 In addition, if either of you would like to appear on WichitaLiberty.TV to discuss that matter, we can do that too. Castle Rock developer arrested. The Morning Sun, October 8, 2015, http://www.morningsun.net/article/20151008/NEWS/151009892. He’s no longer on AM radio at KQAM, but people still want to hear him. So for now there’s the Joseph Ashby Show podcast. Subscribe to the podcast on Podbean. Click here for this. Follow The Joseph Ashby Show on Twitter. Click on @JosephAshbyShow. An editorial in the Kansas City Star criticizes a Kansas free-market think tank. Kansas City Star editorial writer Steve Rose penned a column accusing Kansas Policy Institute of lies and distortions in its analysis and reporting on Kansas government.1 Here, we take a critical look at a few accusations. It is axiomatic that government is the worse way to fund and provide services, with a very few exceptions. Why is this? When government spends money, the spending falls into one of two categories: First, it may be politicians and bureaucrats spending someone else’s money on yet someone else. Or, it may be politicians, bureaucrats, and special interest groups spending someone else’s money on themselves. 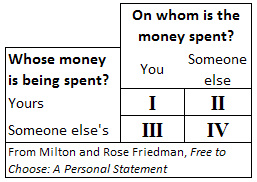 When goods and services are provided by the private sector, it’s either people spending their own money on themselves, or spending their own money on someone else. We all would be better off if we relied less on the state and if more was provided by the private sector. Education is not one of the exceptions where government is a better alternative to private sector provision. I think that this qualifies as the “long, boring details of the truth” that Rose complains of. I wonder if he understands this. All he has to do is retrieve data from Kansas State Department of Education. Yes, these numbers include interest on debt incurred from borrowing to build school facilities. Rose seems to say this money should not be counted as part of the ongoing cost of schools. But where should it be counted? 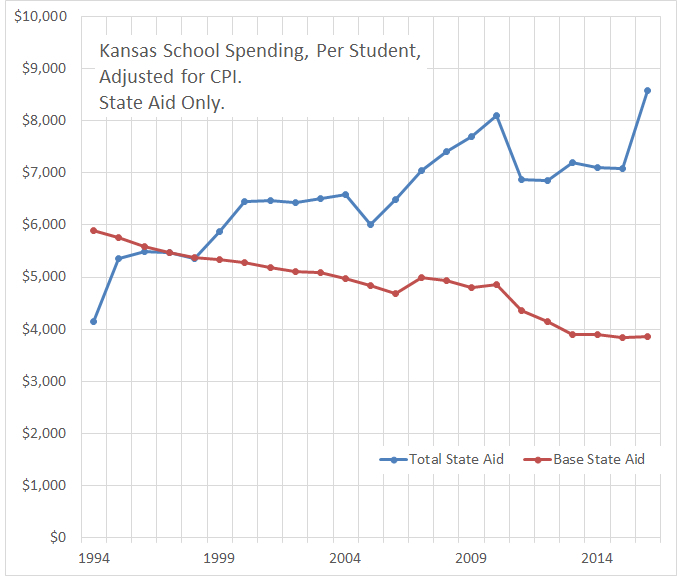 Capital costs like these can’t be ignored, yet the Kansas school spending establishment often deflects attention from them, contending these costs “don’t get into the classroom.” Irony alert: These costs are the classroom. 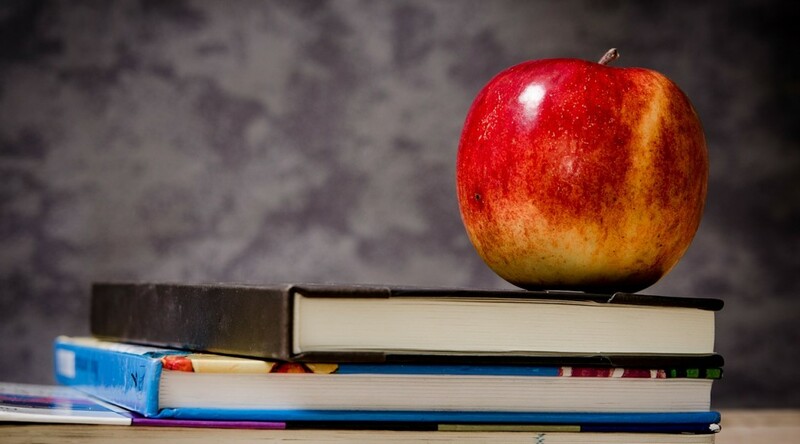 Retirement fund costs for teachers? 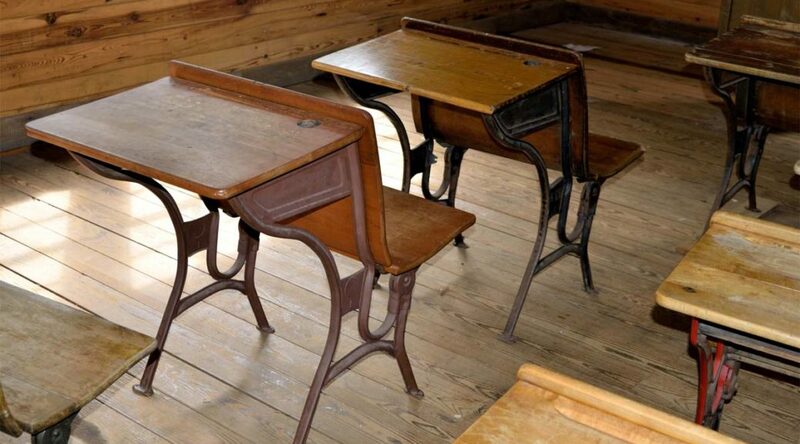 If not for schools and teachers, would the state have this cost? So where should these costs be charged? Whether we’re spending too much (or not enough) on these items is another matter. But classifying them properly should not be controversial. Rose’s criticism is characteristic of the political class and its enablers. When the actual cost of government is revealed, the response is to attack the messenger, and truth is cast aside. But Rose is correct about one thing: Pass-through federal money costs the state nothing. It is the state’s taxpayers that pay the federal government so it can send funds back to Kansas as — according to Steve Rose — money without cost. 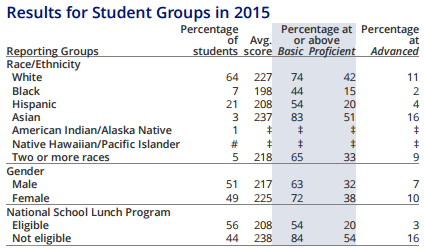 NAEP scores for Kansas reading, grade four. I’m not satisfied with this, and I don’t think Steve Rose and the Kansas City Star should be. This is the saddest thing about Rose’s column. 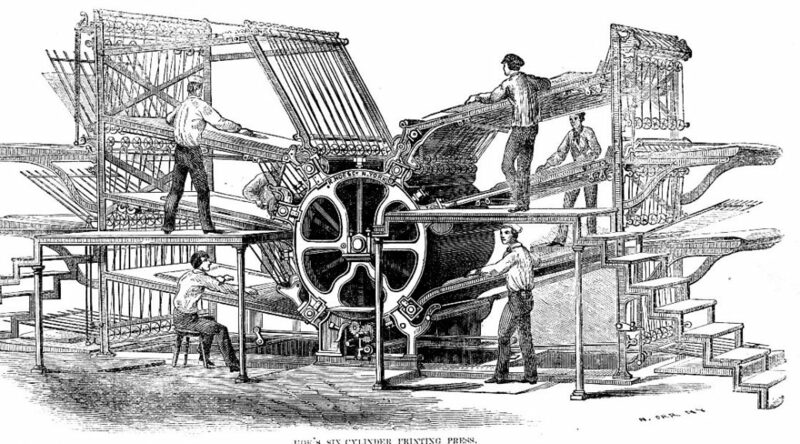 It used to be that newspaper editorial writers worked to hold government accountable. Now we have this newspaper making excuses for government and unfactually criticizing those who work for accountability. 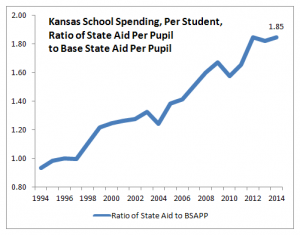 It’s Kansas schoolchildren, especially poor and minority, that suffer the most. Wichita Eagle, where are you? The state’s largest newspaper has no good reason to avoid reporting and editorializing on an important issue. But that’s what the Wichita Eagle has done. 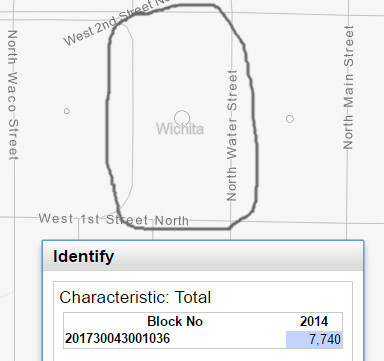 In November 2014 Wichita voters rejected a proposed Wichita city sales tax. The largest portion of that tax, $250 million, would have gone towards expanding the capacity of the Aquifer Storage and Recharge, or ASR, project. The Wichita Eagle editorial board urged voters to approve the tax. 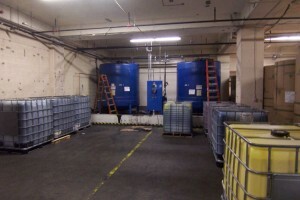 It told readers that spending $250 million on ASR would “assure a future for Wichita with enough water.” “The needs are clear,” the editors wrote, adding “Investing in the aquifer project seems the best thing to do to anticipate and meet Wichita’s water needs.” The Eagle warned of “much higher water rates” if the sales tax is not passed. Since voters rejected the tax to support that spending, the cost of providing adequate water has dropped, and dropped a lot. But you wouldn’t know that by reading the Wichita Eagle or by relying on our city’s other mainstream news media. If you viewed a Wichita City Council workshop on December 1, however, you’d have learned that the city can provide adequate water for much less than $250 million. The rise in water bills will also be much less than what the Eagle and the city used to frighten voters into approving the sales tax. 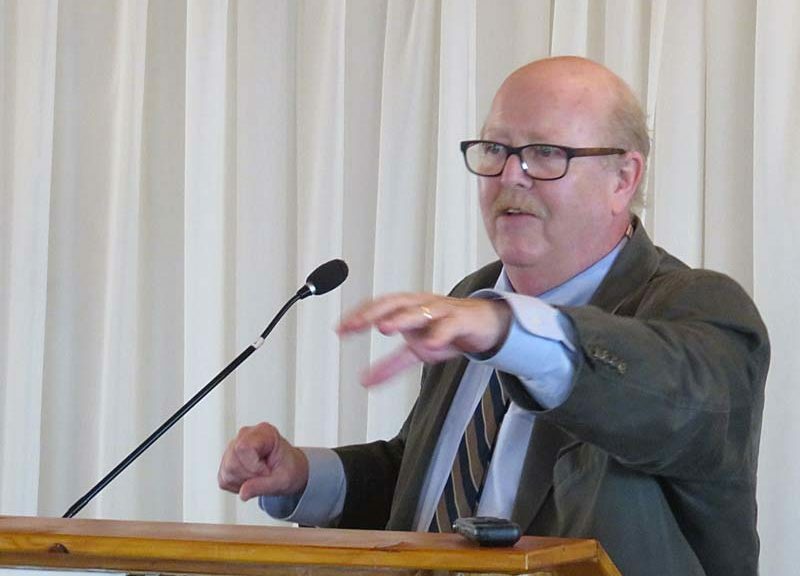 So why hasn’t the Wichita Eagle reported on the December 1, 2015 workshop, in which Director of Public Works and Utilities Alan King presented the new plans — plans which will cost much less? Why have there been no editorials celebrating that we can provide adequate water at much less expense? I can understand the editorial writers not wanting to admit they had been duped. That’s human nature. But for the news division of the Eagle: Why no reporting on this? As it happens, the newsroom of the Eagle was also a cheerleader for the sales tax and ASR project. As an example, the Eagle printed a fact check article that disputed claims made by opponents of the tax. When asked why there was not a similar fact check article on the proponents, the reporter said there were no errors to be found. Nothing. That was incredulous — unbelievable — at the time. There were many questionable claims made by sales tax proponents. In hindsight, we are even more certain of that. 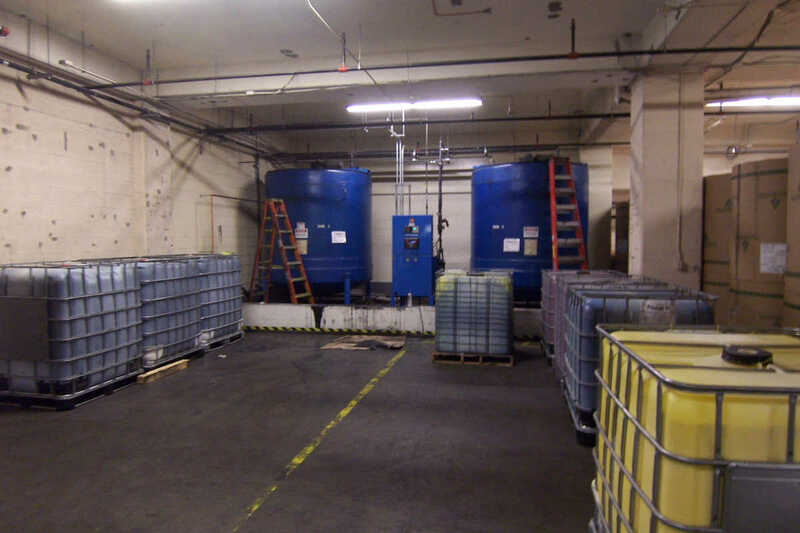 Tubs of ink the Wichita Eagle could be using to tell us what we need to know. The Eagle has plenty of reporting capacity, barrels of ink, and lots of online bandwith to report and editorialize on issues like who gets free parking at the Wichita airport. That’s important, perhaps, but trivial in terms of financial impact. But on this issue involving over $100 million in savings, there is silence. The state’s largest newspaper has no good reason to avoid reporting and editorializing on an important issue. But that’s what the Wichita Eagle has done. We wonder why. 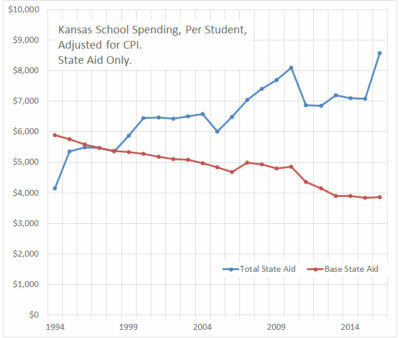 The average Kansan is misinformed regarding Kansas school spending, and Kansas news media are to blame, writes Paul Waggoner of Hutchinson. Math questions, one would think, are very straight-forward and easy to answer. At least easy to guess the right answer in a simple multiple choice test. Such is not the case however with the average Kansan who follows state issues relying on the headlines in the Kansas press. The reality of how poor a job the Kansas press is doing with numbers is found in a December 2015 SurveyUSA study of 500 plus registered voters in Kansas. 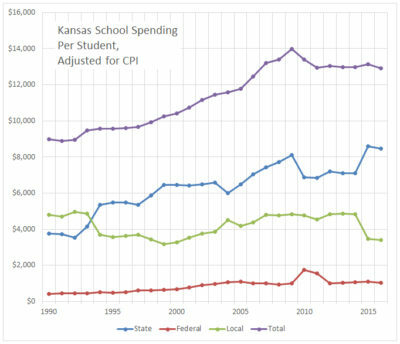 This scientific study of voters’ knowledge of educational spending in Kansas was virtually ignored by the Kansas media. Most likely because its implications don’t fit the media narrative on education in this Year 5 of the Age of Brownback. Even worse, the poll was commissioned by a conservative think tank, the Kansas Policy Institute. As to voter (mis) understanding this 15 question poll hit the jackpot. All the questions were multiple choice with only 4 options given. Question #6 asked how much state funding do you think Kansas school districts receive per pupil? The correct answer is well over $7,000 per student. 39% of Kansas voters thought it was under $4,000, another 22% thought between $4,000 and $5,000. Only 7% of voters guessed properly. 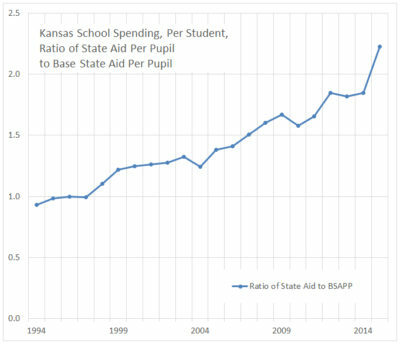 The follow-up, Question #7, was how much total (federal/state/local) funding do you think Kansas school districts receive per pupil? The correct answer in 2015 was over $13,000 per pupil. Only 5% of registered Kansas voters got that one right. 40% thought the total was under $7,000, and 21% said $7,000 to $10,000 which were the two most inaccurate options! At this point I was even wondering how the accepted wisdom is so far removed from the truth. 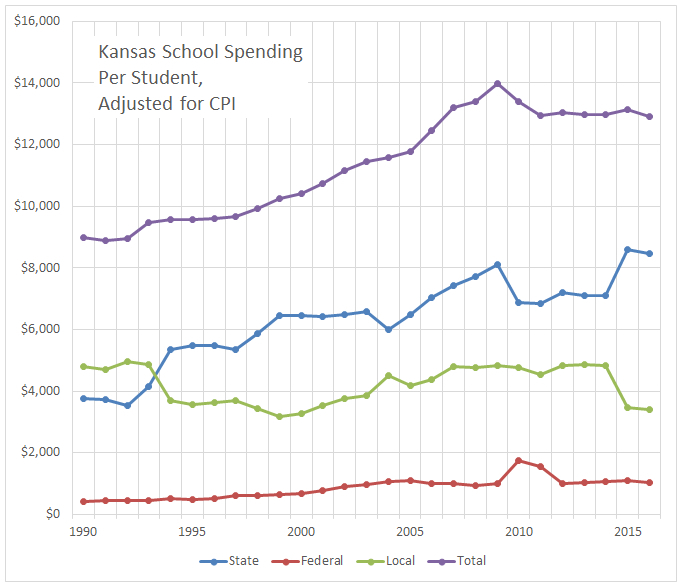 So I went to ksde.org, the website of the Kansas State Department of Education, to verify the precise figures. At that website every school district in the state is listed. What our local school districts spend is very close to the state averages. The Hutchinson USD 308 budget was over $60,000,000 in 2014 with 4,836 full-time students or $12,449 spent per pupil. 5 years earlier the USD 308 budget was $57 million, 5 years before that it was about $41 million. The comparable figures for USD 313 Buhler are $12,360 per pupil in 2014 with a $26,300,000 budget that 5 years earlier was $22,200,00 and 5 years before that was $18,000,000. For USD 313 that meant students were educated for just $9,000 per pupil as recently as 2005. 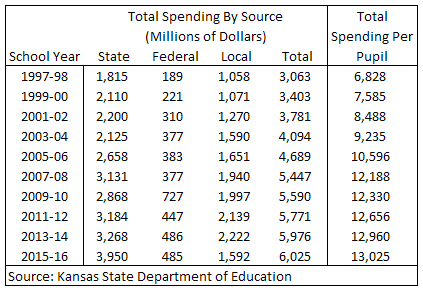 Kansas school districts total spending is $2.0 billion higher now than just 10 years ago ($6 billion versus $4 billion). That is an incontrovertible fact. Which leads to two immediate questions: How can the Supreme court keep claiming the spending is constitutionally inadequate? And what exactly do taxpayers have to show for the extra $2,000,000,000 every year? The reality of those numbers are nowhere in the publics’ consciousness currently. For instance, SurveyUSA question #8 was “over the last 5 years how much do you think total per pupil funding has changed?” The correct answer is that it is actually up 9.92%. But fully 47% of Kansas voters confidently said it had dropped over 5%! Another 15% were sure it had dropped but thought the percentage was smaller. Only 7% of voters knew that school spending was up “over 5%’. The budget trajectory has changed and is on a much flatter curve than ever before. 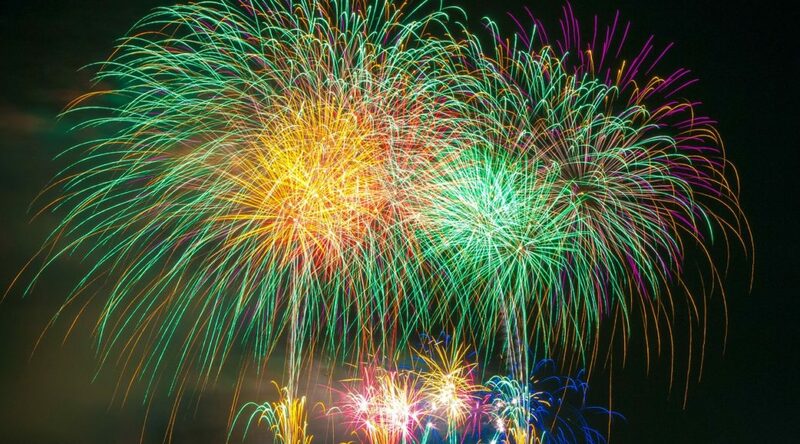 Taxpayers are mostly rejoicing, tax spenders (and their allies) are howling mad. 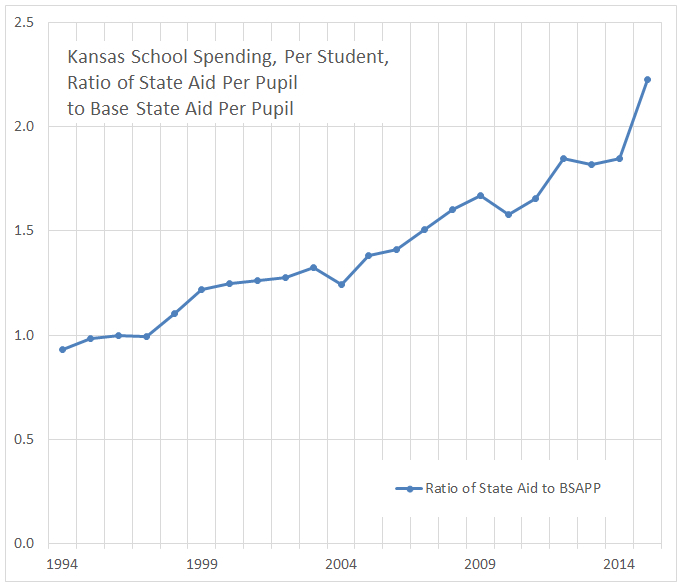 My revised school spending narrative is frankly the story of the entire Kansas budget (as can be easily accessed at budget.ks.gov “Governors Budget Report FY 2017”). The state general fund budget first hit $1 billion in 1980 and grew consistently under Governors Carlin/Hayden/Finney at about a 6.5% annual rate. 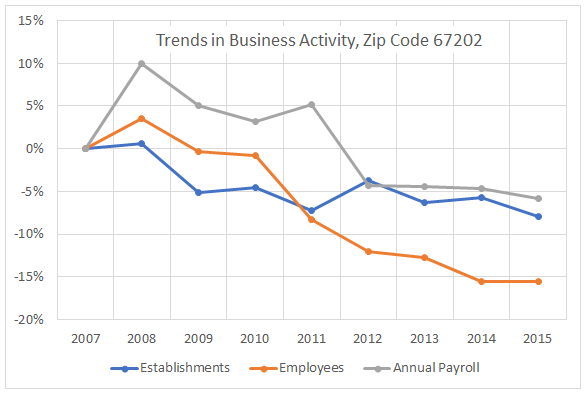 Under Graves and Sebelius that accelerated growth rate continued until the 2008-09 recession when the state budget dropped dramatically for 1 year under Governor Parkinson. This made a cumulative annual growth average of around 3% for those three administrations. Under Governor Brownback the general fund budget is still going up, but at a 5 year annual growth rate of 1.8%. 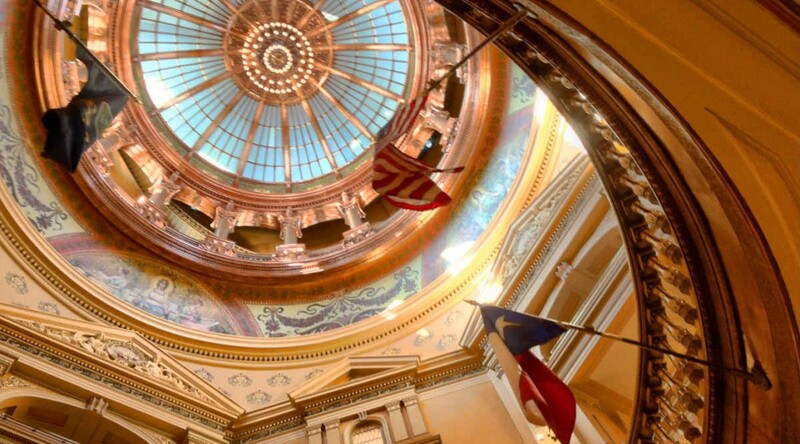 On February 20th one Hutchinson News columnist’s headline blasted the “Deliberate financial starving of the state of Kansas.” I see this as more of a diet, and I say it is about time. The numbers on the state budget spending (and taxation) are readily available online. The execution of the plan for this new governmental trajectory leave something to be desired, but that is the topic for another day. Kansas City Star editorialist Steve Rose visits with Kansas State Senator Jim Denning. It’s helpful for Kansans to have commentary and factual injection accompany a Steve Rose editorial in the Kansas City Star. In this case let’s look at a column based on his interview with Kansas State Senator Jim Denning. A government can balance a budget by taxing more or spending less. We see the clear preference of Rose here: There is not enough taxation. We now have an efficiency study that shows some ways to save money. 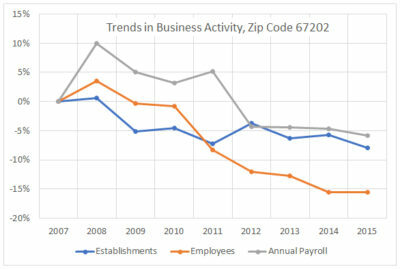 The question is why didn’t the legislature commission this study in 2012, the year in which it cut taxes? It’s a shame to see Republicans — or anyone, for that matter — referring to tax cuts as “rolling the dice.” Cutting taxes simply means that people are allowed to keep more of what is rightfully theirs in the first place — which is a good thing. There is legitimate concern that the 2012 tax cuts were distributed in an unfair or unwise way. The way to fix that is to cut taxes for those who didn’t receive the purportedly unfair cuts. As far as the results of the tax cuts, the governor should not have bragged as he did. The ability of government to manage the economy is limited, especially at the state level. Consider the Obama stimulus. The nation’s unemployment rate was always above the rate the administration predicted if there were no stimulus. 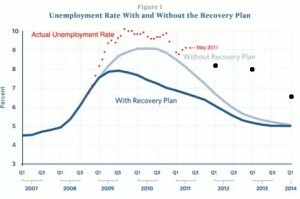 See Brownback and Obama stimulus plans. Further, what is the role of taxation in Kansas? 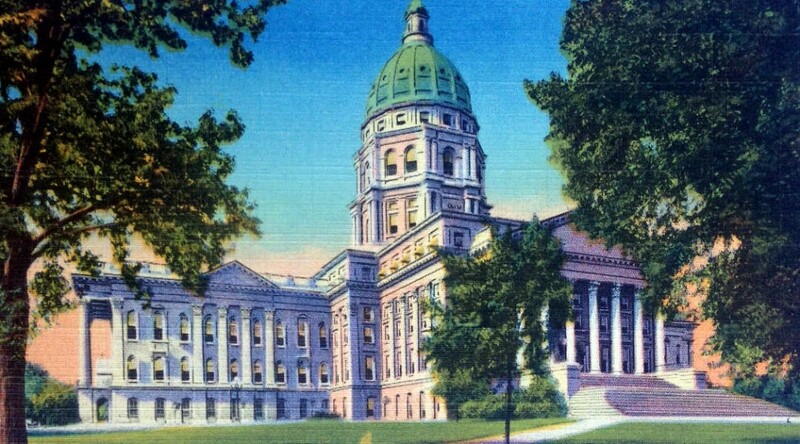 Is it taxation or government spending that is purportedly good for the Kansas economy? Is it to support spending? If so, the tax cuts have not have an effect on spending. While some programs have been trimmed, overall state spending continues on a largely upward trend (for all funds spending) or remains mostly flat (for general fund spending). 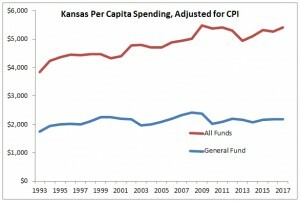 See Spending and taxing in Kansas. The LLC loophole Denning refers to is the zero income tax on pass-through business income. 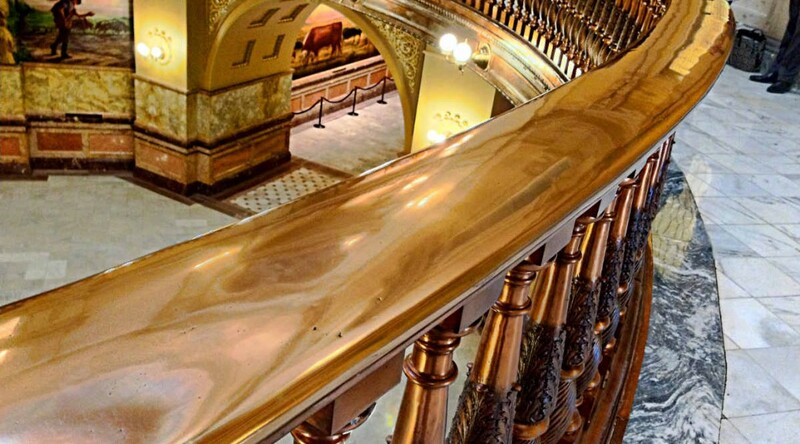 Eliminating it and recapturing the $200 million would not have balanced the Kansas budget. In fiscal years 2014 and 2015 the state spent $340 million and $308 million more than it took in as revenue. Spending restraint is necessary. It’s hard to justify Denning’s claim with facts. 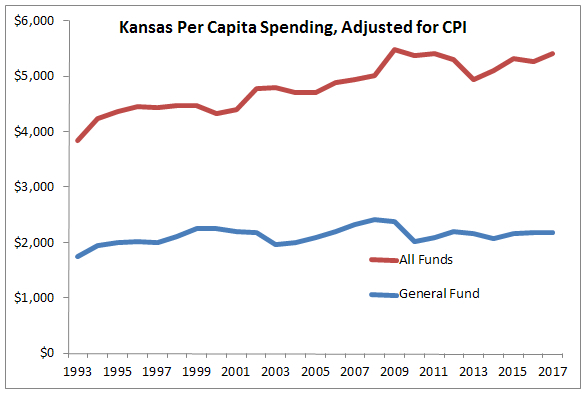 See again Spending and taxing in Kansas.